The Raven Giving Fund Supports Children and Youth in Foster Care | Raven Hydronic Supply Ltd.
Day to day, the ins and outs of running a thriving business can distract from the fact that our business is a part of a larger community. 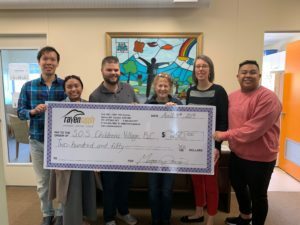 One way that our company keeps our connection to our community in focus is through the Raven Giving Fund. Introduced in 2018, the Fund provides each of our team members with $250.00 a year to donate towards a community group of their choosing. For Office Administrator Megan Davies, this meant giving to a local organization that she holds dear- the S.O.S. Children’s Village in Surrey BC. Megan has a background that includes teaching english to school aged children overseas, so we weren’t surprised when she decided to spend her Giving Fund allotment on programs for children here at home. A super sized cheque for some super kids. “I chose this non-profit because I’m passionate about children and raising kids in a healthy, loving, and safe environment,” she says. S.O.S. Children’s Village provides Lower Mainland children and youth in care with an alternative model of foster care that operates separate from the provincial system. S.O.S. Children’s Village services includes foster homes, an inclusive and supportive community, and social, art and therapy programs all designed to help foster children and youth grow into caring, self-reliant adults. One of the most unique aspects of this approach is ‘the village’ – a cluster of of 5 foster homes where children live together with adults who care as a community. Megan’s contribution of $250 through the Raven Giving Fund can be used to cover the costs for a session of the Village Learning Club– a homework club where foster children can get help from BC Certified Teacher Support as well as enjoy themselves through guided games and physical activities. A street view of the S.O.S. Children’s Village in Surrey BC. S.O.S. Children’s Village in Surrey also helps fill another major gap in support many teens in care face when they ‘age out’ of the system, usually when they’re 18. S.O.S. Children’s Village makes sure the youth in their care are ready once it’s their time to strike out on their own with a gradual independence program. Teens start gaining the knowledge they’ll need as adults beginning at 16, and the program culminates with them receiving an “apartment in a box” with many of the supplies they’ll need – including a bed. more about S.O.S. Children’s Village in Surrey and to get involved, visit them online here.